Free Top Edge and Single Stencil Included! Our beautiful geometric wall pattern "Alexa" will make a stunning accent wall in any contemporary room! 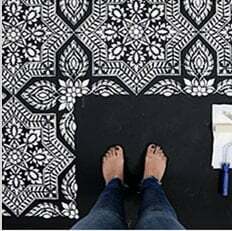 This stencil design is also perfect for curtains, floors and sisal rugs! Geometric wall stencils are super trendy and are sure to spice up any decor. Stencil wall patterns are a great money-saving alternative to wallpaper. Stenciling offers complete customization of your space with unlimited paint choices to perfectly match your decor! This stencil pattern comes with an additional FREE Top edge stencil: the upper part of the design cut as a smaller separate stencil. It makes it easy to fill the gaps close to the ceiling line after your main pattern is stenciled. We even included a small single stencil just so you can get into all the tight places when finishing your wall pattern. Most of our stencils do not require the use of spray adhesive, however this crisp wall pattern can definitely benefit from it. If you want to minimize paint seepage or are using high contrasting colors, spray adhesive is very helpful (Elmer's spray adhesive seems to be the best). Make sure you shake the can well and lightly mist (not drench) the stencil, and let it dry for a moment before positioning it on the wall. This step will prevent the adhesive residue transferring to the wall. You'll need to re-mist the stencil after a few repeats. Note: you will still need to hold the stencil in place with a few pieces of blue painters tape! Adhesive by itself is not enough to hold the stencil on the wall. Clean-up tip: Spray the stencil with Simple Green to help to remove adhesive residue. Our Blog "Stencil Stories" is packed full of illustrated tutorials and inspiration! Please check it out to get some stencil ideas and learn new stenciling techniques! We post new decorating ideas daily! And make sure you watch our short step-by-step Video Tutorials! Try this stencil with our new Clip-on Stencil Level, (sold separately) and discover how easy it is to achieve perfectly level results without dealing with all those bulky heavy bubble levels and annoying laser levels. We cannot recommend the Level enough, it's a real time-saver and is so handy!